Whether you are an athlete or a beginner, this modern performance trainer will allow you to elevate your explosiveness and endurance, while refining form. 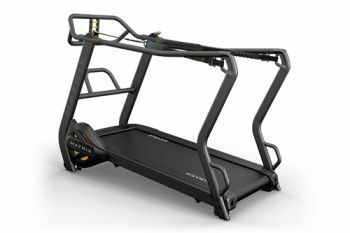 By providing a combination of what can be expected from self-powered treadmills, weighted sleds, resistance parachutes and harness systems, this performance trainer allows you to focus on your own performance. This performance trainer has a sled brake with eight settings to provide a true-to-life weighted sled pushing experience and a parachute brake with 11 settings, giving the feel of real parachute resistance. It also features a seven-degree incline, ideal for building strength and explosiveness with proper form, whether you are performing forward, lateral or reverse movements. If you would like to start High Intensity Interval Training (HIIT), this performance trainer is a suitable machine because of its low-inertia design that offers true-to-life ground reaction force and quick deceleration. Its full perimeter handrails offer easy entry and exit and support during lateral movement. The true zero start and unlimited top speed offers a wide variety of users the ability to match their workout experience to their needs and fitness goals.